I shared this on Instagram early in March, but haven’t yet shared it here. 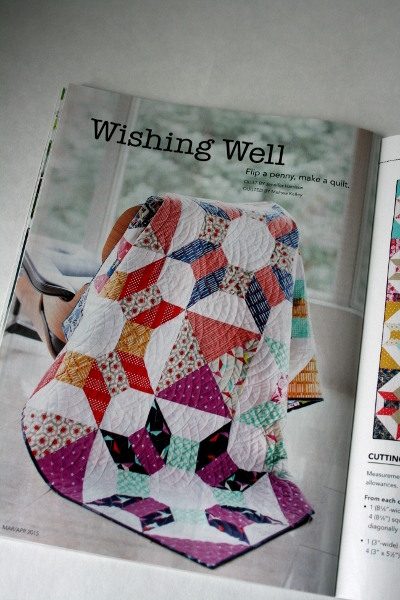 I had the opportunity last year to design a quilt and send it off to Quilty Magazine. Imagine my total shock when I opened a nondescript manila envelope with my name on it and saw my quilt on the cover. On the cover! When I first saw it, I was speechless as I processed what I was looking at. And then I held it up in the air and started jumping up and down and sort of screamed to my family what it was. We were in the middle of finishing the dishes after our Sunday dinner and they all turned and stared at me, trying to figure out what on earth I was screaming for. Then I started laughing and crying and my husband started filming and they all started laughing at me. Trust me, not one of them had ever seen me behave like that before. In fact, I don’t think I ever remember behaving like that before. It was terribly funny. But the fact is, even after looking at it for three weeks, I kind of can’t believe it. My quilt. Published. It’s all so strange and yet such a happy gift. They did a beautiful job of photographing it and the quilt arrived home this week. I’m excited to take some pictures of my own and share more. 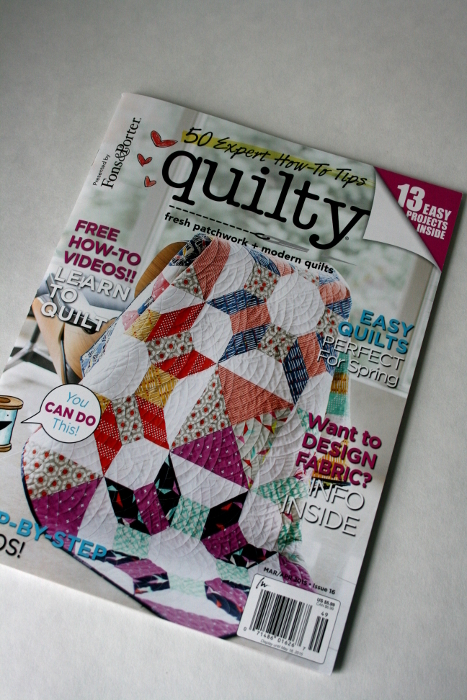 If you’d like to see more, or make one, it’s the March/April 2015 issue of Quilty Magazine, available on newsstands now. It’s a big block that’s dramatic and fun to make. There are some really great patterns in the issue and I’m honored to be a part of it. Shocked and honored and giddy and all sorts of emotions. Crazy! Congratulations, Jennifer. I can see why it made the cover: so beautiful and dramatic! You go girl!!! so pretty! You are awesome. I need to go get my copy so I can make it! I love it and way to go so awesome!!!! Congrats Jennifer. It is a beautiful quilt made by a beautiful, creative soul. That quilt is the reason I bought the magazine. It is fabulous! I am so sad to see Quilty go away. It is one of my favorite magazines.